Cipex (Circulatory Performance Enhancer) is a unique pelleted blend of natural herbs that alleviates symptoms associated with the pain and inflammation of degenerative joint disease, osteoarthritis and navicular. Recommended as a continuing treatment for afflicted horses. Designed to help horses with navicular problems by dilating blood vessels and increasing blood flow. 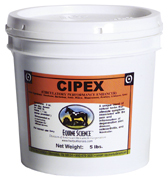 Cipex also helps laminitis. Cipex contains these Active Herbs: Hawthorne, Buckwheat, Nettle, Willow, Meadowsweet, Rosehips, Stevia and Echinacea. Dosage is 2 ounces per 1,000lb horse daily. A 1 ounce scoop is included.